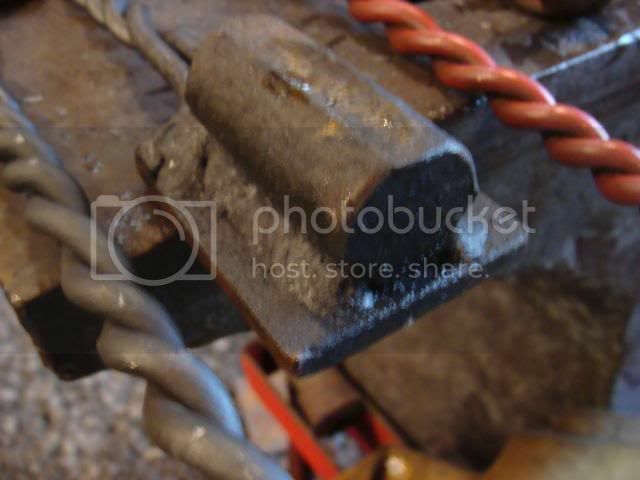 After I finished mounting the tire hammer today, I made a pair of 3/8-inch, square bit, bolt tongs. 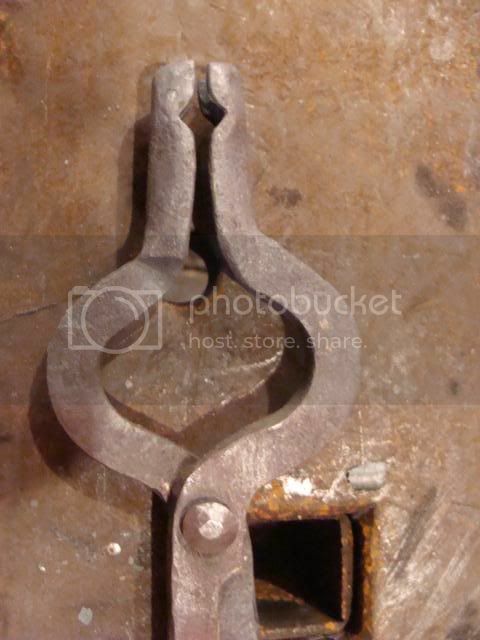 The tongs are part of an order of four; 1/4-inch, 3/8-inch, 1/2-inch, and 5/8-inch. They are made from 11-inches of 1/2-inch coil spring. 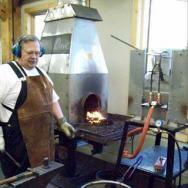 The total length is 18-inches and it takes me between an hour and a half and two hours to forge a pair. The coil spring makes a stout pair of tongs. Nothing fancy, but a strong, sturdy, tool. Nice job, how do you like the tire hammer compared to your kenyon hammer? Nice Dave, Thanks for the pics! The tire hammer hammers circles around the Kinyon. I've been having a lot of trouble with the kinyon. 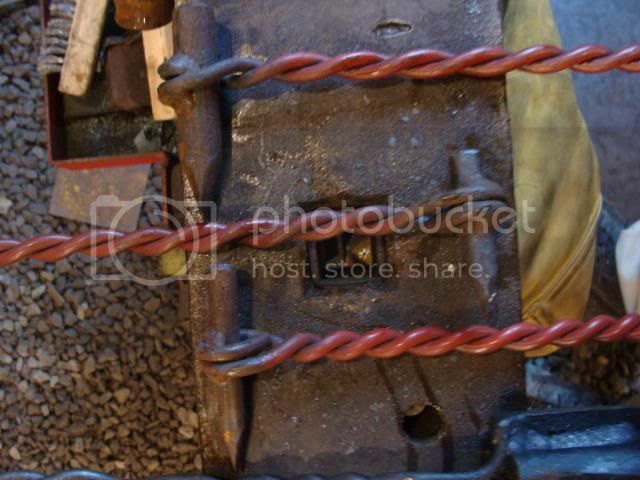 I was having to adjust to work with tooling, and then readjust to actually forge the metal. The adjustment on the kinyon is suppose to allow it to do a small 3-inch stroke or to do a full 13-inch stroke. Mine was doing the 3-inch stroke regardless of where the roller valve adjustment was positioned. Clay told us in the tire hammer class not to grease the hammers. It hit me like a brick wall the other day, that grease is the only thing I put on the Kinyon. I sprayed some WD-40 in there to help thin the grease and lube the hammer. It is now doing full 13-inch strokes when I want it to, and is running faster with more control. With that said, the tire hammer STILL hammers circles around the Kinyon. I estimate it hits about 50% faster than the Kinyon and even though the Kinyon hammer-head is 10 pounds heavier, the tire hammer has a more solid hit. The tire hammer doesn't run as smooth as a Little Giant but it's close enough. I'll get pictures of the tooling later. Thanks for the compliments......I'm really enjoying tong making. I really like tire hammers and had heard many good things about them..You got a nice one there..We would have bought one had we found one when we needed it..Theres a guy about 45 minutes from me that loves his, Ive been wanting to go down and try it out..
Im sure it will make a world of difference for you..
OK! Long awaited tool photoshoot. Overview of my entire collection of PH tools. (Small collection!) The only thing not pictured are the spring fullers, which are pretty standard. Experimental half-round flatter. 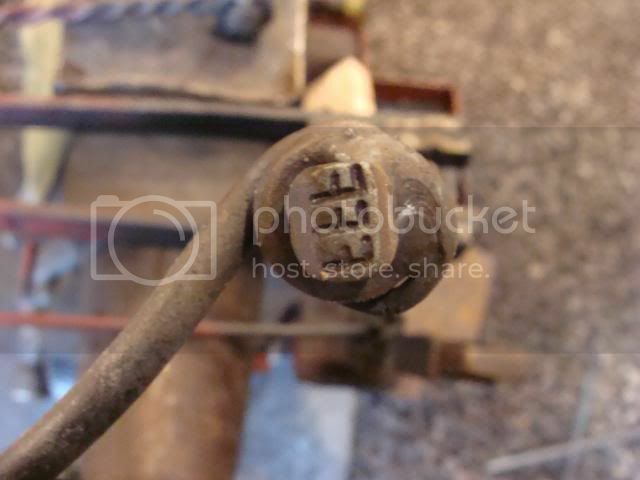 The bottom piece is leaf spring, and the top is mild. (Notice the wear.) A new, one-piece version is in order, made from race car axle. 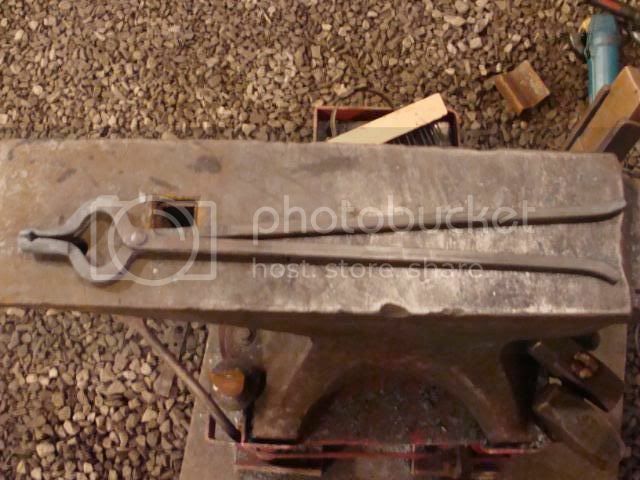 Flatter or edge of anvil tool, used on the tongs in this thread. Made from large leaf spring. 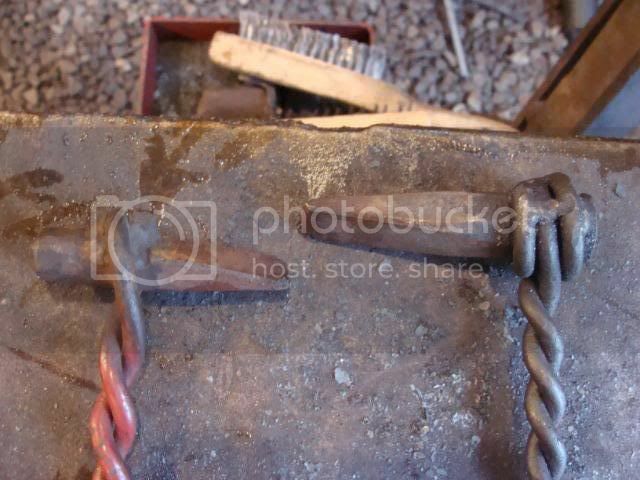 Chisels made from coil spring. The left hand one is better-shaped/proportional than the right one. 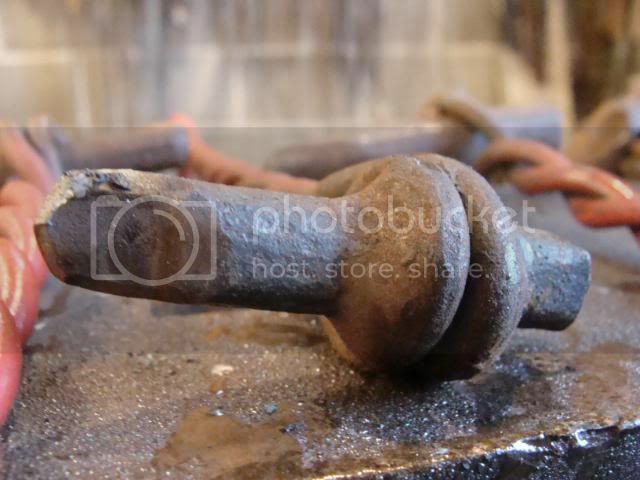 Bob punch made from a tiny ball peen hammer (right,) a small punch made from spring steel (middle,) and a large punch made from a ball peen hammer. Slitters; 1/4-inch, 3/8-inch, and 1/2-inch (The 1/2-inch slitter is the one with the angled edge. I prefer the angled style to the round style as it seems to punch a better hole.) All made from S-7. Tenon swedge! 1/4-inch, 3/8-inch, and 1/2-inch. Unfortuneately, my holes were not straight. The tool works, but needs to be remade. It was made from race car axle. 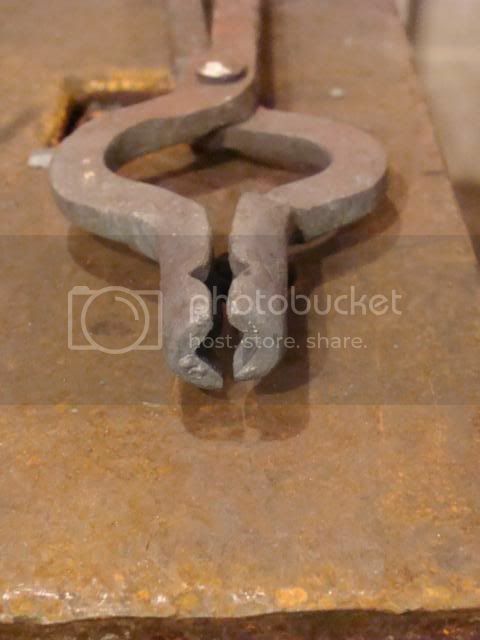 Fiery Furnace Forge Blacksmith LLC touchmark, forged from S-7 steel. Since taking classes at JCC I have actually learned how different tools work, seen some entirely new tools I'd never seen before, and learned how to make tools. All the tools pictured have been made in the last six months or so. My speed has improved so that it's no longer an all day ordeal to make a punch or chisel. One or two heats, wip together a handle and in 15 minutes I'm back on track. I've still got a lot to learn, and I look forward to more classes and/or apprenticeship, so that I can learn more. The tongs are nice and have a professional "store bought" look. I stamp the touchmark in the metal hot. This is really a must because the way I made mine, the letters are raised. This creates more surface area to stamp into the metal. 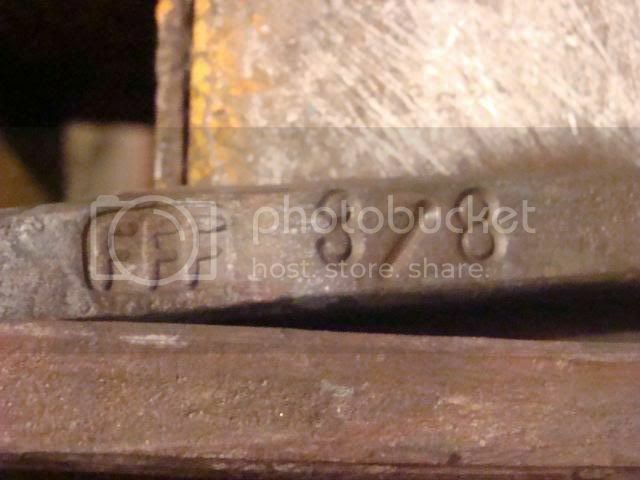 If you make your mark, where the letters are stamped down into the metal, you could probably stamp cold. Mine is holding up quite well. I did mig the handle onto the tool. 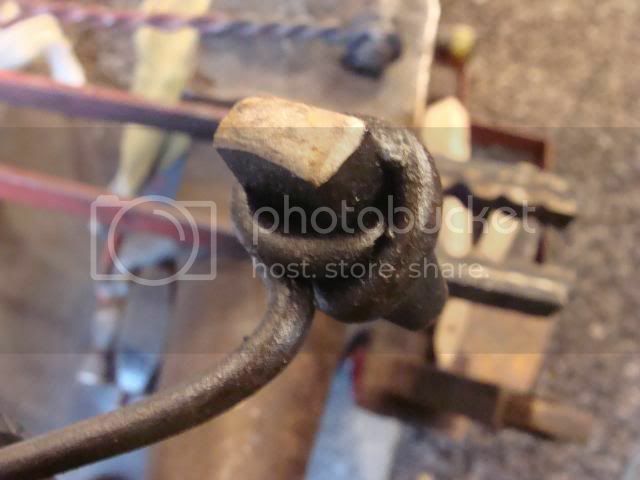 With PH or treadle hammer tools you should weld the side oposite from the handle. It distributes stress more evenly. I did mig the handle onto the tool. 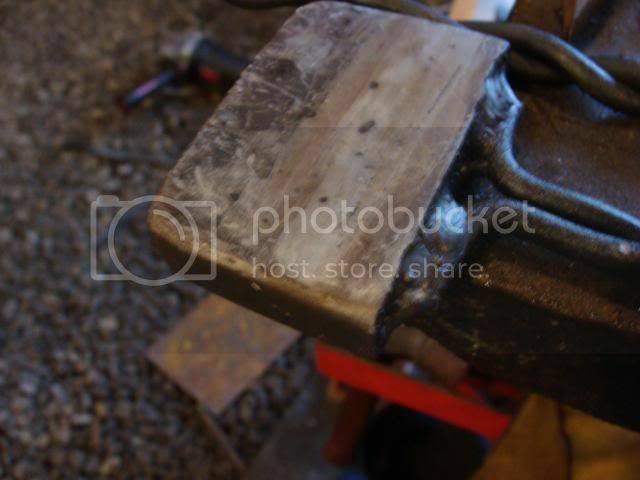 With PH or treadle hammer tools you should weld the side oposite from the handle. It distributes stress more evenly. PM sent about tong prices. Hayden.....tools MAKE a power hammer. 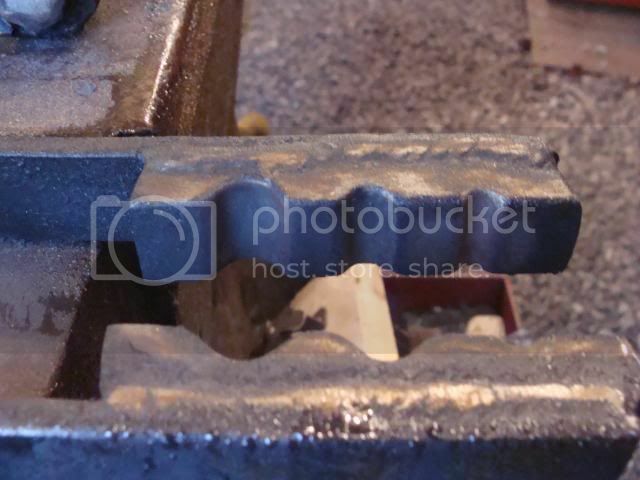 The edge of the anvil tool alone opens up a tong of different things you can do. Without tools, a power hammer is just a bigger taper machine. With tools (and practice,) you can texture, punch, groove, recess, etc, etc, etc. I'm only just beginning to learn. 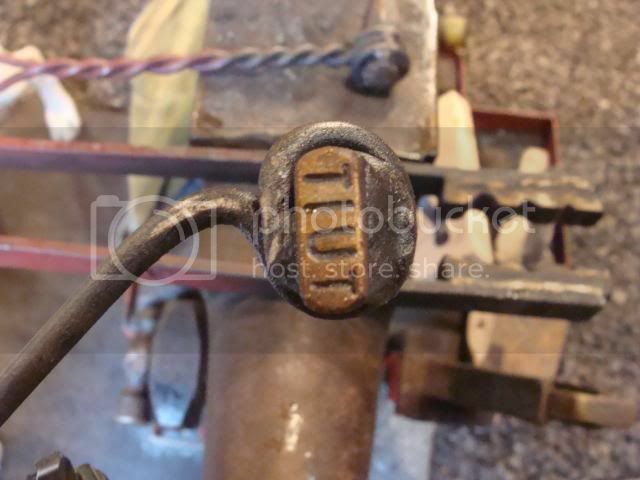 Mr. John: you are saying to basically make the tool the way I've done, but weld the apposite side! LOL That's funny 'cause everyone that has told me about PH tools here, has said the other way. It's funny how different people can do the exact apposite to achieve they same end. I'll try both ways and see what I like I reckon! First off, great tongs! Second, great ph tooling. 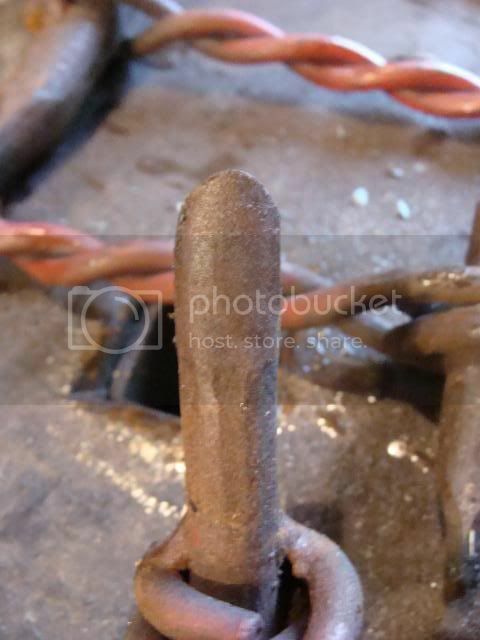 I have some old industrial tooling that had heavy duty handles and the shock on the hand was terrible. The 1/4" round solves that problem. Looks like your touchmark handle is at a 45 degree from the punch. 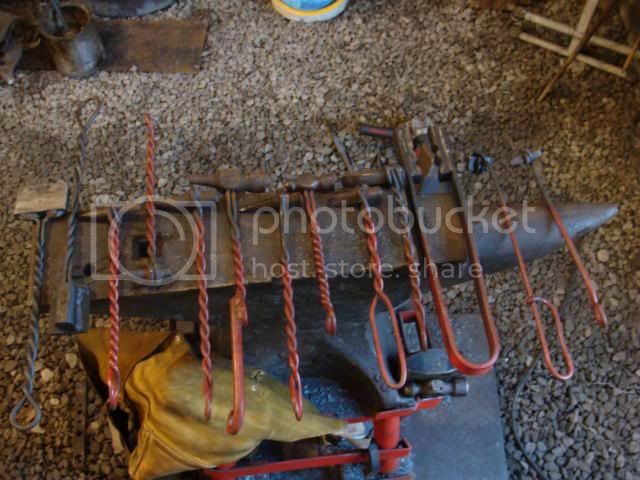 That's the way I did mine too and it's so much easier to position and see where you're putting it on the hot metal. 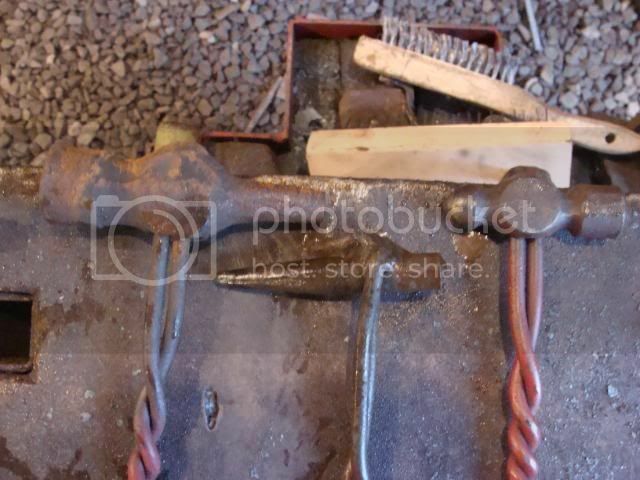 So why not do that with the other tooling that has a rectangular shape to it? Seems better than having to work 90 degrees off of the metal as far as body position is concerned. I see that you have your new hammer installed. Mine is still sitting outside the shop waiting for the base to be poured. I have it all wrapped up in a big, blue tarp, so I can say I have a "Big Blu" hammer! All my pictures of the build are on Allan's farm website; if you want any, go ahead a copy them. Nice selection of PH tools. 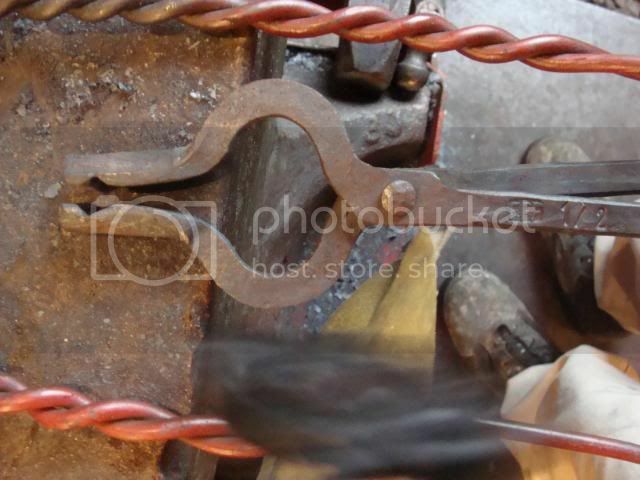 I have been making mine from coil spring steel. I harvested 62 auto coil spring from a local speed shop. Many wire diameters and coils. He gave them to me for free! Hey Dave! Get that hammer put in position! LOL "Big Blu" ROTFLOL! I haven't gotten to look up all those photos. I was out of town when Allen sent those links out and couldn't pull them up. I'd plumb forgotten! :( I'll have to pull those up tomorrow! Free is an awesome price! I pay $10 a piece and about 20 phone calls to the junk yard before I can get the guy to find them for me!